The Puking Pangani & Other Tanzanian Tales. 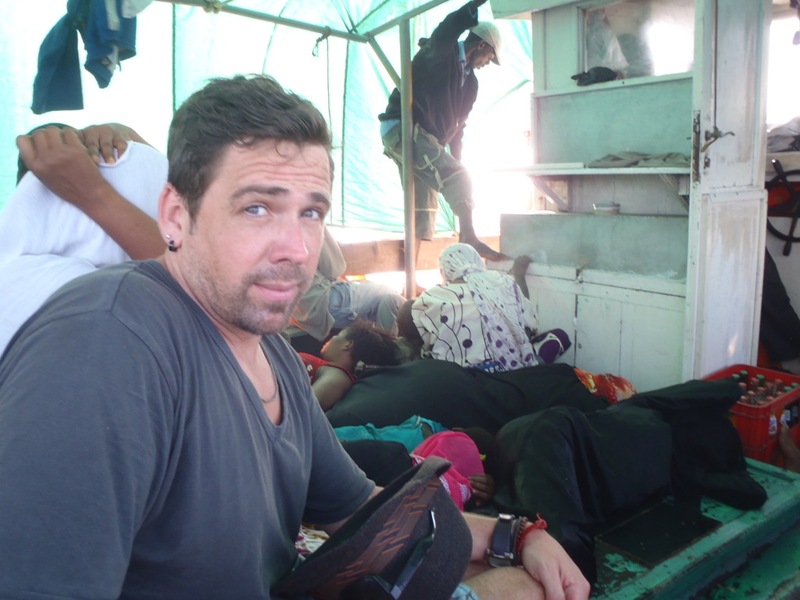 Wednesday, January 18th (Somewhere in the Indian Ocean): I think it was just over 3 hours in….Just about the half way point when we couldn’t see land on either side. I was struggling to see some sliver of a horizon between the gaps of the frazzled forest green tarp that was tied around us to stop sea water from splashing in. My legs were sore from being crumpled in the the same position on the bench for hours and my arms burned from clinging to a pole as I braced against the constant rocking of the waves. But not all of us were up-right. You couldn’t see the the boat floor as it was strewn with different colored silks from the Tanzanian women that were ill with sea sickness. I put down head down on Ray’s arm and breathed in the strong scent of his sunblock to help calm my queasy stomach from the outside ‘stale air’ and tried to figure out how we got so BAMBOOZLED. *INSERT FLASH BACK CHIMES HERE* It all started just several months ago when our hearts nearly skipped a beat when we came across a picture of a boat floating in the crystal turquoise waters of the Indian sea—we were reading a blog from our friend Sarah whom was doing some volunteer work in Tanzania and immediately we were inspired to be ‘TRANSPIRED’ straight into that picture. 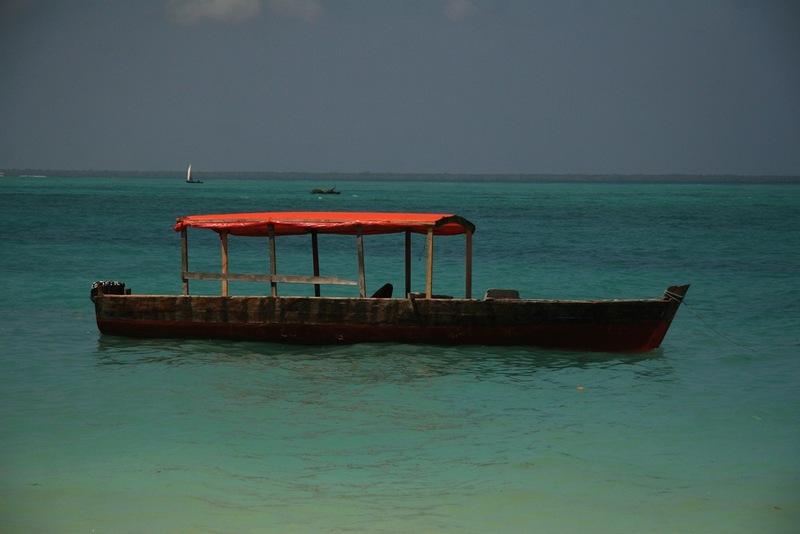 It never left the back of our minds—that intoxicating snapshot of the island of Zanzibar. And then, just as we were planning out where our ‘feet would land in 2012’ a magnificent opportunity arose….. and like anything in life, with a little elbow grease and a ‘dash of determination’—a dream, became reality. They’re only fools if they say its ‘luck.’ ….. but then again, they’re also fools if their stuck in the middle of the Indian ocean at ‘pontoon cruising speed’ with no land in sight, too. 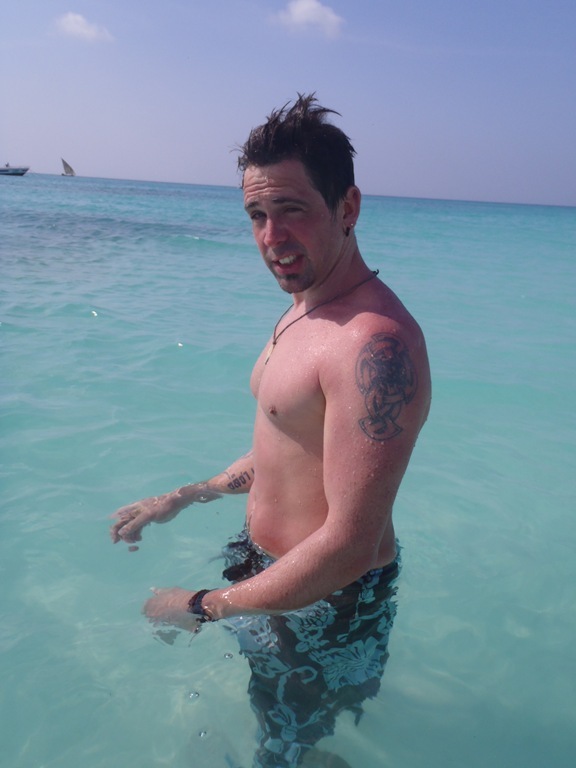 Thursday, January 12th- Tuesday, January 17th (Zanzibar, Africa): I remember thinking I hadn’t felt this kind of lush sticky warmth for well OVER a year as I stepped off that airplane when we touched down on the island of Zanzibar. As I have mentioned ‘once or twice’ we have been a bit unsuccessful on this ‘endless summer’ weather-front…. But from the sweat already running down Ray’s face, perhaps our forecast was finally brightening up. 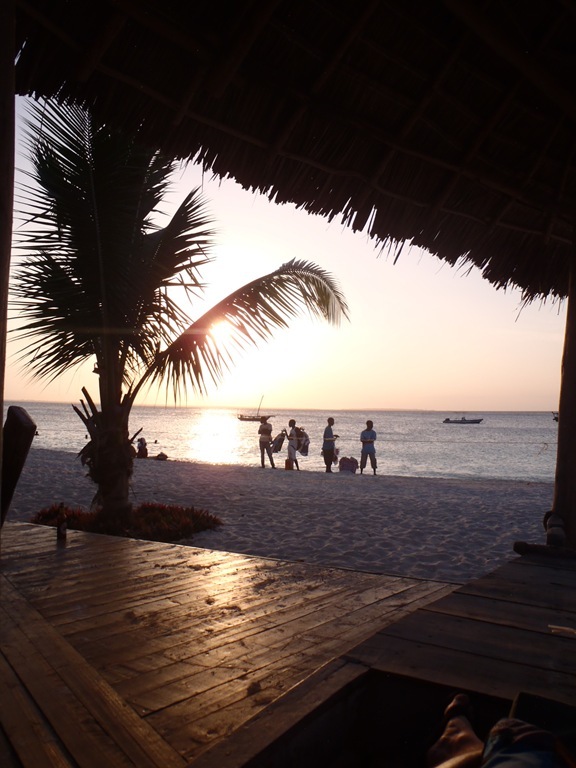 This island was going to be our starting off point to our next new workaway opportunity off the coast of Tanzania near a village called Pangani; a tented lodge known as Mkoma Bay. 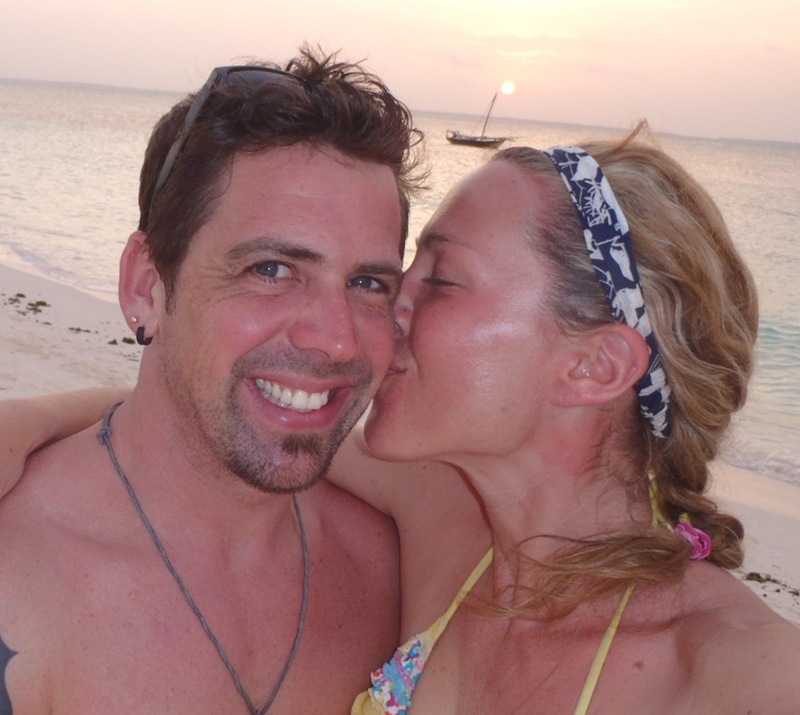 So before we headed 35km’s cross the sea to the mainland—we thought we might as well make the most of this ‘ho hum-drum’ white sandy tropical-tastic’ island and call it… a week. So we tucked in and sucked it up. We decided to stay at the backpackers haven at the northern tip of Zanzibar called Kendwa Rocks and make this our stomping ground for the next 6 days as it just so happened to be some of the most beautiful stretches of beaches on the Island and semi- cheap accommodations. (Zanzibar, in a nutshell—was a sticker shock central) It also just so happened that we had this massive ‘body bag’ with 2 kites and a kite board that we were dragging around with us. 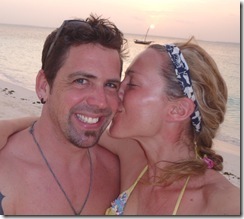 So travelling around LIKE a backpacker was nearly impossible….. We were ‘beacons with our baggage’ straight off the bat. 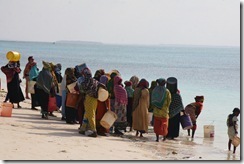 Especially with their baggage claim system here in Zanzibar; a man comes out and hands baggage off one by one, (talk about personal service- and an excuse to ask for “TIP….TIP”) and you can only imagine the curious looks we got from the locals and the other passengers…. But then, we should be used to the ‘looks by now.’ I guess that’s just how the Wyatt’s roll. SIDENOTE: These kites were already joked at as ‘the most well travelled non-used equipment,’ (stored in the top-box of Diva since we left in May 2011 from Minnesota- with the only use in Long Beach, Cali) so we were gagging at the chance to finally be able to get them out and see them soar……. 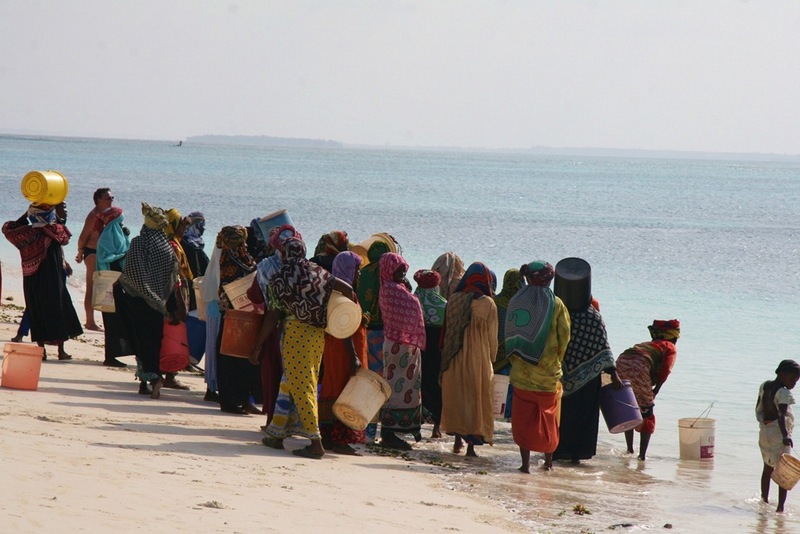 But practical to carry whilst crossing turbulent seas in a small local boat? ….. perhaps just a bit ‘more used’ now, is all. A) Malaria pills = 100 proof sunblock We quickly forgot how sensitive our skin was back in 2007 when we traveled to S. Africa and Asia whilst taking these crazy-pants ‘my skin is transparent’ pills. I can quite honestly say we have never doused ourselves with so much sunblock in our lives. I would have bathed in it if I could. Yup, its still me, folks…. the ultra ‘bronzed’ sun goddess. But we were literally turning shades of purple…… That’s just no good for anyone to have to see. B) Zanzibar (Kendwa area) although mesmerizing, is economically supported by its tourism—and therefore we were identified as a ‘Mzungu’ (White Person…with money) And it unfortunately took away from our experience of the culture and people a bit, as we were always paranoid that we were being taken advantage of. 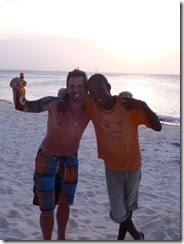 Luckily, we did meet some genuine Tanzanians along the way on the island like our friend Freddie.…. and forged some great lifelong friendships. We learned that sometimes, just a few simple questions can open up a flood gate of answers and bring you so much closer someone’s culture—and what defines them. The pace was slow in Zanzibar, and something we had to readjust to after an intense December of hard travel, feasting and family. Glorious really. We had sadly just finished up our stay with the B&B in Aze’ France (caretaking for the owners for 6 weeks), then drove down to the S. of France to visit our good friends Juri and Majourie via the alps (Diva got caught in a snow storm), we then worked our way back up to Lyon and spent the holidays with ‘our French family’ (my best friend Stacy Sue married a French man and they ‘adopted’ Ray and I as their own), which twisted and turned around one celebration to the next……To sum up December, we couldn’t figure out what was more full—our bellies or our hearts? 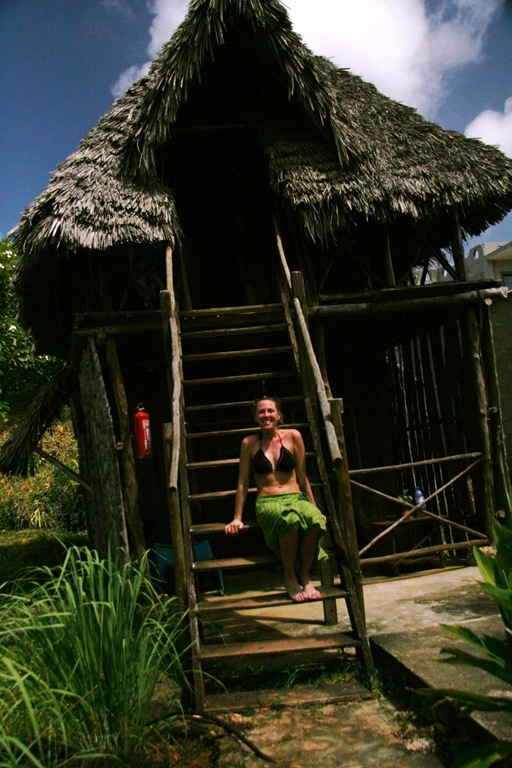 But as we laid under our thatched umbrella that last day on Zanzibar (and cursing our malaria pills) we squinted across the sea towards the mainland with anticipation as to what lay ahead….. What new adventures and opportunities would working at Mkoma Bay Lodge hold? 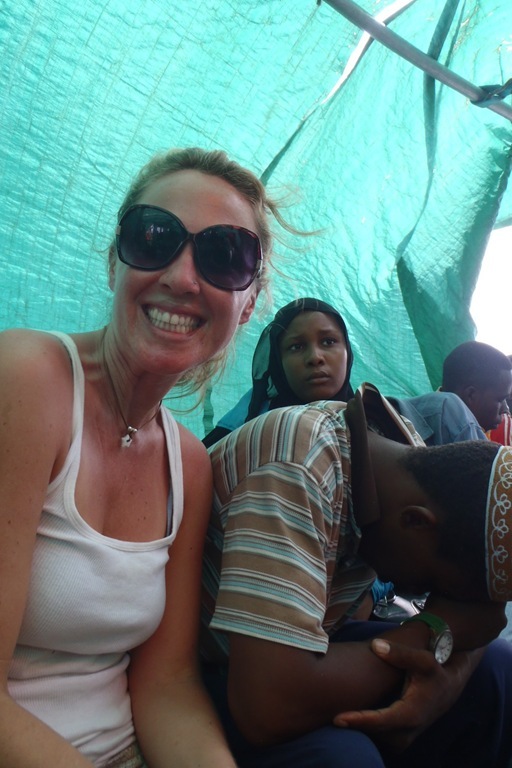 The Tanzanian Visa was stamped through to the beginning of April—and there was only 35km’s of sea standing in our way. Unfortunately for us, those 35kms would be the longest of our lives. Wednesday, January 13th (Bamboozled): We should have known. It was no ones fault but our own, really…. 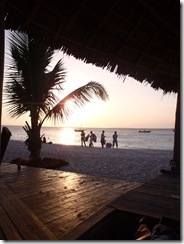 There was a perfectly fantabulous boat that came directly from Kendwa Rocks straight to the beach of Mkoma Bay. But it was $150 USD. We only had only $100USD. 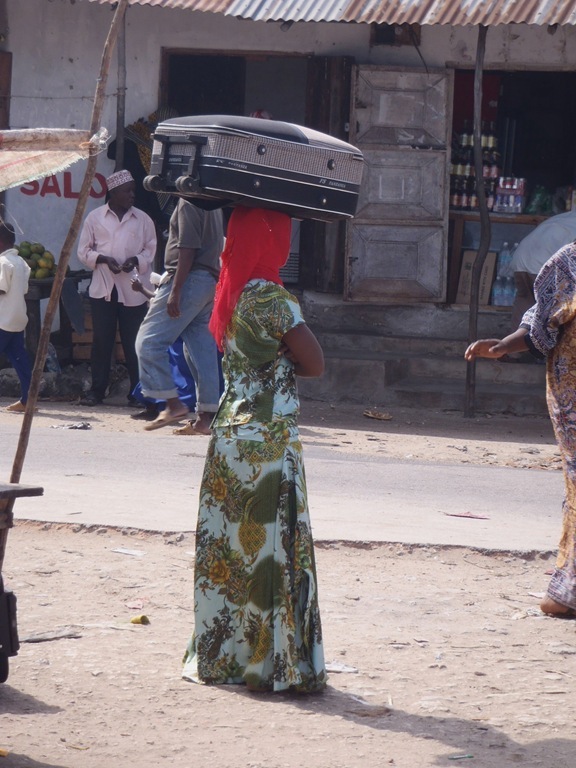 There was only one ATM on island, and that was in Stonetown, a village about 50 minutes away via a dirt road and Dalas-Dalas (open-sided overcrowded kerfuffles of a minibus- a real treat)…. money would be spent on transfers and exchange fees back from Tsh (Tanzanian Shillings) to USD. FAR too much work when we could easily negotiate something for the $100 we already had, right? SIDENOTE: I must note, that in an attempt to be smart about our funds we had asked our transfer driver on the way from the airport when we first arrived to stop at the ATM in Stonetone. Well, between the 26 hours of travel we had just experienced to get there from London and the new beads of sweat dripping into Ray’s eyes, I think he got confused/blinded. Ray took out 30,000 TSH. Got back into the car and slipped the money off to me so I could safely put it in my wallet and out of sight. We later found out that day he only took out $20 USD. Our bad. Kendwa Rocks told us that they could match our $100 and get us to Pangani (a town about 4KM from Mkoma Bay) via a town called Mokotoni just 35 minutes away on a private Dhow-like boat that left at 10am. Sounded simple enough. 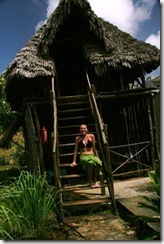 (hardy har) We handed over our $100 USD, hopped into the cab to Mokotoni that Wednesday morning and off we went. We were at the small port village by 9:45 am and around 11:45 after Ray’s 3rd coin trick with the local children we started getting worried……. Where is this boat? IS there a boat?? All the sudden we were rushed to the beach as we were told that it ‘was time.’ Time?!? 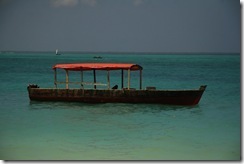 We still hadn’t even laid EYES on this boat…. My instincts told me to drag that body bag in the other direction and never look back…. I should’ve listened. All the sudden we were being taken into a building just off of the beach. Out of the corner of my eye I could see this rickety boat with what it looked like people bursting at the seams. But I stayed positive, surely—this couldn’t have been OUR boat. We quickly realized that the building we were entering was immigration. HUH?? Customs? For what? This was getting bizarre….. They brought us into an office and there was a man (very nice official-man) that calmly told us that “This is the last time this will be allowed.” Of course, we didn’t even play dumb when we asked…. “WHEN WHAT IS ALLOWED?” …. “The boat,” he said, “it isn’t safe…. locals only…. 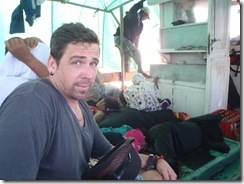 no tourists….there isn’t enough life jackets, it’s not safe—you see.” I just kept hearing—“NOT SAFE”….. and then I saw our bags being rowed out to the old rickety boat with people bursting at the seams. OH HOLY HANNA….. My mom, she’s going to KILL me. I can’t tell you exactly how we got through the next 6 1/2 hours….. or how many times I looked into Ray’s eyes so we could just FOCUS on getting through it. But we weren’t even the ones that were the most terrified. A young boy next to me with his girlfriend (whom was laying under my legs on the floor beneath me ill) was frightened of water. Can you imagine? On this boat…. 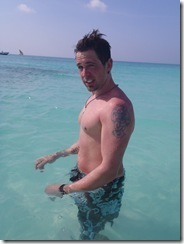 and horrified of water. I tried to explain that I could swim, I would save him. It was ok. Then he got sick into one of those little black plastic bags…. I guess I wasn’t as comforting as I thought. If I don’t see another ‘black plastic bag’ it will be too soon. In the beginning, the captain was fighting us for more money… we had to try to explain how much we already paid. Ray very calmly let him know that we paid $100 USD for ‘this boat.’ We found out from the only other white people on the boat (1 German and his very sea-sick friend) that the going rate was 10,000 TSH. That is $6 USD. Which means along with our ‘transfer from Kendwa’ (which maybe should have been $10-15 USD max) they made a killing off of us ‘Mzungu’ that day. 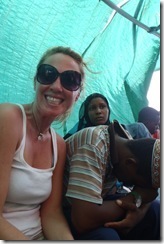 When we arrived to Pangani the captain of (‘The Puking Pangani,’ now coined) came over to us as we were disembarking. (aka—climbing down the boards of the rickety boat onto the row boat to bring us ashore) And he apologized. We weren’t sure if it was because of the ‘boat journey’ or because of what we ‘paid.’ But it was heart-warming to say the least…… Like we shared something. We had ALL broken down our boarders within those 6 1/2 hours and become very vulnerable. And we were stronger for it. Some were a bit more dehydrated then others but all in all, we needed a good bathe. But at that moment, I just couldn’t wait to get my feet on land….breath the fresh air into my lungs…..celebrate our great feat. Papasi were of course waiting to greet us in droves, and I can quite honestly say they too, had never EVER sounded SO good to my ears.